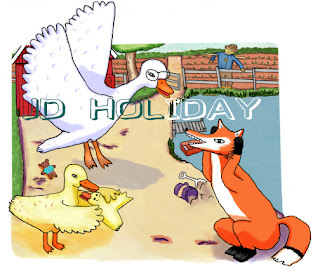 Janoose the Goose is visiting her cousin, Molly the Duck on the farm. Janoose likes the barnyard very much but she must go home because there are no job openings there. 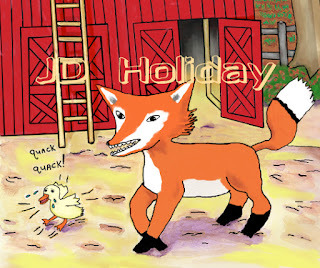 When her flight home arrives, the fox has begun a crime spree, and Janoose is the only one who can stop him. 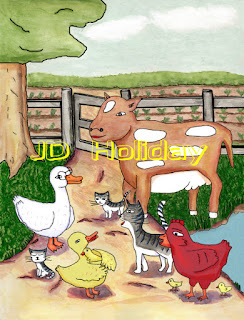 Author and Illustrator J.D. Holiday wrote and illustrated the picture books-Janoose The Goose, Janoose and The Fall Feather Fair, and The Spy Game. She also has a chapter book for 6 to 9 year olds, The Great Snowball Escapade and an eclectic collections of short stories for adults in Stories & Imaginings For The Reading Spot.